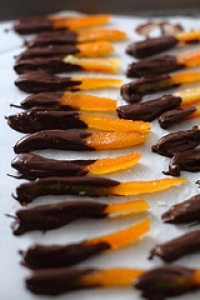 Have you made Candied Orange Peel Dipped In Chocolate? 1. makes 1 1/4 cups candied peel, 2 1/4 cups syrup This recipe relies on a decimeter with a syrup density test tube which you can order from La Cuisine 1-800-521-1176. 2. They also have email: LaCuisine@Worldnet.att. 3. net. In terms of the chocolate used for dipping, you can use regular chocolate or you can used Couverture which contains more cocoa butter and will create a thinner, glossier coating of chocolate. 4. You can get it at specialty stores and La Cuisine should have it as well. 5. Begin preparation at least 10 days ahead. Score the peel of each orange into six vertical pieces, and remove the peel. 6. (The fruit is not needed). Scrape most of the white pith from the inside of the peel. 7. Fill a large stainless steel, glass, or enamel saucepan or casserole with water and bring it to a boil. 8. Add the peels and boil them for 5 minutes. Have ready a bowl of ice water. 9. 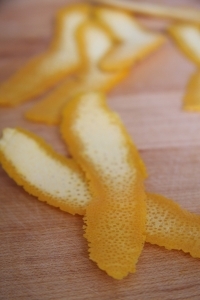 Drain the peels and immediately plunge them into the ice water, then drain them again. 10. (This sets their orange color). In the same large saucepan, bring the 4 1/4 cups of water, the sugar, and the vanilla bean to a boil, stirring constantly. 11. 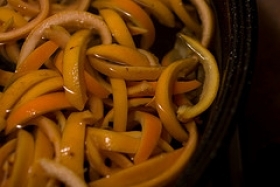 Remove the pan from the heat and add the orange peels without stirring, swirling the pan slightly to incorporate them. 12. Cover tightly and set aside at room temperature for 3 to 4 hours. 13. Heat the mixture, uncovered, for about 5 minutes, or until a decimeter registers 1140. 14. Remove the pan from the heat, cover, and set aside until the next day. 15. Return the pan to the heat, uncovered. Bring it to a boil and bring the syrup to 1160 on the decimeter. 16. Continue in this way for nine more days, each day increasing the density by 20 gradations. 17. This takes about 2 minutes after the syrup comes to a boil. 18. On the sixth day, when the density of 1240 is reached, add the 2 tablespoons of corn syrup to prevent crystallization. 19. On the ninth day, increase the density by 30 gradations, to 1310. 20. 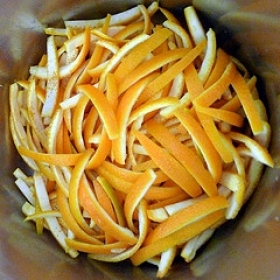 Allow the peels to sit for at least 2 to 3 hours longer. 21. Drain the peels, reserving the syrup for another use. 22. Then cut them into thin lengths and allow them to dry for several hours. 23. This prevents the chocolate from seizing (becoming stiff and unworkable). 24. Notes: Always use the decimeter when the syrup is hot, as the density increases when cool. 25. Pour the syrup into the syrup density test tube and insert the decimeter. 26. The denser the syrup, the higher the decimeter will float and the higher the reading will be. 27. To coat the Orange Peels in Chocolate: Line some baking sheets with smooth aluminum foil or wax paper. 28. Break the chocolate into pieces and place all but about 4 ounces in the top of a double boiler set over very hot water (but not hotter than 160 F). 29. . The water must not start to simmer. 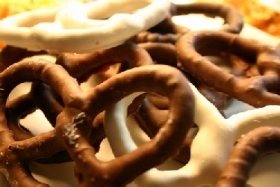 (The chocolate may be melted in a microwave oven if stirred every 15 seconds). 30. Remove the double boiler insert from the base and add the reserved unmelted chocolate. 31. Stir continuously until the temperature of the chocolate reaches 88 to 91 F (84 to 87 F if milk chocolate). 32. (If you are not using a thermometer, dab a small amount on your upper lip. 33. It should feel cool). Remove any unmelted chocolate when the mixture reaches the correct temperature. 34. (To maintain this temperature, place the pan of chocolate on a heating pad set on "low. 35. " Plastic wrap helps to keep it free of chocolate!) Add the peels, a few at a time, to the melted chocolate, and using a fork (preferably a dipping fork), lift them out one at a time, tapping the fork against the side of the pan to drain off any excess chocolate. 36. 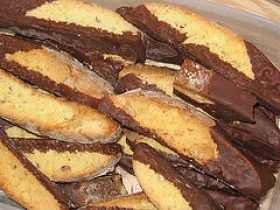 Place the chocolate-covered peels on the prepared baking sheets. 37. 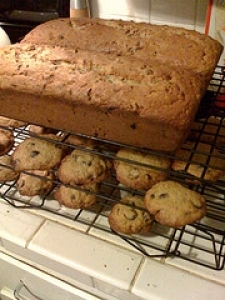 Allow them to cool until the chocolate dulls and they can be lifted from the sheets without sticking. 38. Store airtight. They will keep several months, unrefrigerated, in an airtight container. 39. (The undipped peels will keep for months stored in the same way. 40. 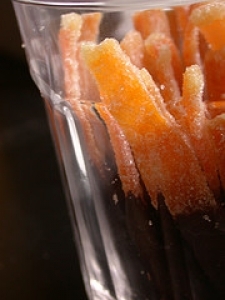 A fine layer of sugar crystals will form on the outside of the peels, which adds interest to the texture). 41. Note: The syrup is delicious diluted with Grand Marnier and sprinkled on cake, adding extra moisture. This recipe contains potential food allergens and will effect people with Beans, Corn, Natural Sweeteners, Oranges allergies.